Excellent Retail Sites Available. 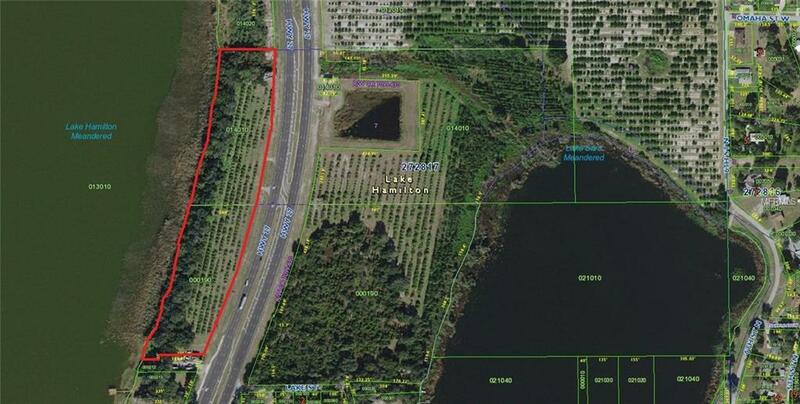 OWNER WILL DIVIDE: 8.2 Acres available on Highway 27 with both highway frontage and Lake Hamilton frontage. Owner will convey all or part of this exciting retail opportunity. Up to 4 lots available with each lot measuring approximately 2 acres (to be determined by survey). Future Land Use classification is Commercial Services (CS). Zoning in the Town of Lake Hamilton is Highway Commercial District (C-1) which allows for most commercial/retail uses. Property features include; US 27 Highway frontage, high visibility, high traffic, true waterfront retail, and commercial C-1 zoning. Actual acreage to be determined by survey. Owner dividing a portion of two parcel ID's to create lakefront highway commercial retail development approximately 8.2 acres on Lake Hamilton. All information to be verified by purchaser. Property ID's to reference are 27-28-17-000000-014010; 27-28-17-829000-000190.